I remember it like it was yesterday. I'm sitting there, in my parent's lounge, as my dad comes down the stairs with what looks like a black box. He peels back the paper sleeve to reveal a polystyrene insert that houses a small black keyboard with stubby rubberized keys, a huge power brick and a handful of cassette tapes. I quickly learn that the keyboard is a Sinclair ZX Spectrum, an 8-bit personal home computer that relies on a cassette deck to load and save games. I played it off and on for a year, getting to grips with games like the The Hobbit and Horace Goes Skiing, but my interest waned when I finally got a Sega Master System and immersed myself in the world of Sonic and friends. The Spectrum was returned to its polystyrene home and placed back in the attic, where it remains to this day. Fast-forward to this week and I'm laying eyes on it again, but in a different setting entirely. Instead of attempting to recapture my youth at my parent's house, I'm in London meeting Steve Wilcox, founder of Elite Systems, whose company has recreated Sir Clive Sinclair's 5 million-selling retro personal computer for the tablet age. The key word here is "recreated." In fact, that's its name: the Recreated Sinclair ZX Spectrum. If you've laid eyes on a ZX Spectrum before, you'd (like me) be hard-pressed to notice a difference between the old model and its newer counterpart. It features the same rubber keys, fonts and even sports faux air vents on the back to match its predecessor. 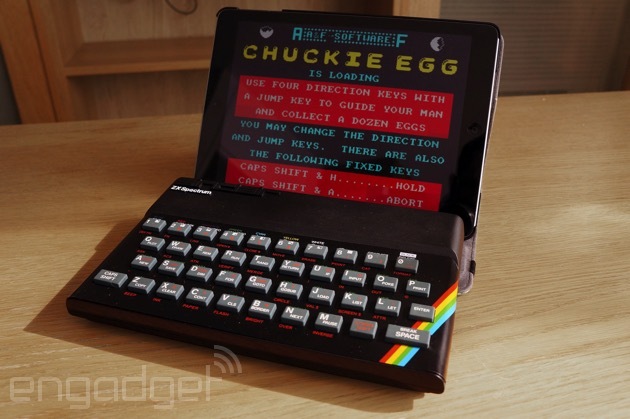 Despite its popularity in the past, recreating the ZX Spectrum hasn't been easy. In 1986, Sinclair sold his loss-making computer business, along with all its rights and inventions, to Sir Alan Sugar's Amstrad for £5 million ($7.4 million today). Then, over a decade later, Sky bought Amstrad for £125 million ($253 million at the time), which meant it became the new owner of Sinclair's intellectual property. In the transition period, many of the old Spectrum designs were lost, including the original wooden models on which the ZX Spectrum was based. Wilcox and his team ended up buying a handful of machines on eBay and 3D scanning them in order to accurately mimic the design. 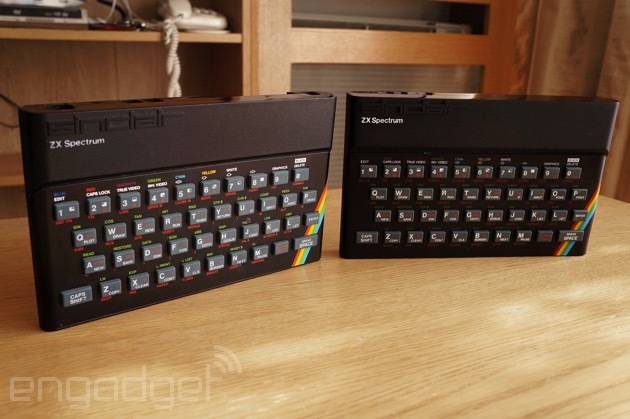 You might wonder what differences there are between the Recreated Sinclair ZX Spectrum and the original. Well, for starters, the new model doesn't do any processing -- it's simply a Bluetooth keyboard. For Elite Systems, it's the culmination of 20 years of experience in the game industry, which have taken it from creating its own games for the ZX Spectrum to porting some of the console's biggest titles from yesteryear over to modern devices like the iPad. "Many of the original games were designed to fully utilize the ZX's controllers," says Wilcox. "On-screen controls can only do so much and we knew we could do better." It's taken roughly four years for Elite Systems to get to this point. Earlier this year, the company raised £63,000 on Kickstarter to fund the tooling required to manufacture the Recreated Sinclair ZX Spectrum. Elite teamed up with Ceratech, a bespoke keyboard maker known for its work in the medical field, to create the keyboard, although it will actually be made in China. In order to imitate and sell the Recreated Sinclair ZX Spectrum in the UK, Elite acquired a license to the Sinclair brand and designs from Sky and will pay a royalty for each unit sold (Sky's lawyers also had a say in its name). As it's essentially a Bluetooth (3.0) keyboard, the Recreated Sinclair Spectrum works on nearly any platform. In my test, I paired it with an iPad Air and then mirrored its screen on an Apple TV. However, you can also pair it with any Android or Windows tablet and use devices like the Chromecast to throw games like Manic Miner up on your big-screen TV. With no embeddable games, the keyboard relies upon existing iOS and Android apps. Elite bundles a free app that launches with a short soundbite of the Spectrum loading sound and offers a number of free games, including exclusive rights to Chuckie Egg, and access to Sinclair BASIC. Other games can be unlocked via 79p ($1) in-app purchases. During my demo, I led Hen-House Harry through a number of levels and the gameplay was exactly like I remember it, as was the tactile feel of the rubberized keyboard. You don't realize just how much you missed those 8-bit soundtracks and super-simple graphics. Elite's history of porting old ZX Spectrum games over to newer platforms landed it in trouble, however. Last year, it was criticized for not sharing royalty payments with license holders, which led the company to pull a number of games from the App Store and vow to rectify the situation. Wilcox says developers can now have their old games developed for tablets and keep 100 percent of the royalties. It has also opened its platform so that those who already have apps on the App Store can now include support for the Recreated Sinclair ZX Spectrum with a few lines of code. If you've been keeping track of ZX Spectrum revivals, you'll know there's also another retro console in town: the Sinclair ZX Spectrum Vega. Created by Retro Computers, this all-in-one controller and console is styled like the original, but features only a d-pad and five directional keys. Unlike its rival, it needs to be plugged directly into a TV, but it does host its own games. Both interpretations have their own merits, but one key difference is that the Vega has been backed by Sinclair Research, the company that Sinclair didn't sell to Amstrad/Sky. It appears that Elite Systems and Retro Computers both started work on their consoles at around the same time -- nearly four years ago. Wilcox tells me that he reached out to Retro Computers over a possible collaboration, where support for the Recreated ZX Spectrum could be baked into the Vega, but nothing ever materialized. Given the age of the original, the Recreated ZX Spectrum isn't likely to register in the minds of the modern console gamer. More like their parents. "One member of our team remembers playing it and he is in his early 30s. That's the sort of age group we expect," says Wilcox. At £100 (around $150), the hardware certainly isn't cheap, but it's already available to pre-order via Zavvi, iWoot and The Hut -- for those who've already decided they want one. Price-wise, it goes toe to toe with the Vega, but it does have the added benefit of working with any iPad or Android app that supports a keyboard. Even when I factor in how I felt when I first held the keyboard and played games I enjoyed during my childhood, I'm left wondering if my thirst for nostalgia is enough to justify the cost. However, with 800 backers on Elite's earlier Kickstarter, some have already let their money do the talking ahead of the keyboard's launch later this spring.